Last year for Halloween I made a wreath for my front door. 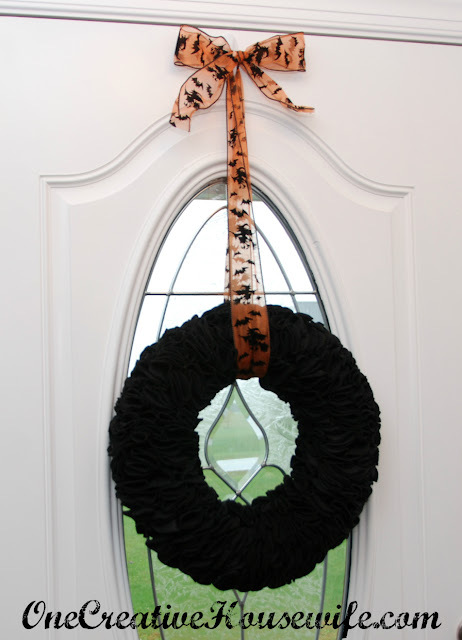 I absolutely love how simple the wreath is, and yet with one look you know it is for Halloween. The wreath itself is very easy to make, but it can be time consuming. To get the ruffle effect, there are hundreds of little circles attached to the wreath. 12" straw or foam wreath - Do NOT unwrap the straw wreath and you will not have to worry about getting straw everywhere. Unsharpened Pencil - with an eraser on the end. Method 1. Straight pins to stick the felt to the wreath. Method 2. Hot gluing the felt onto the wreath. Hot Glue Sticks - A lot!! Cutting Mat* - To cut the felt on. The process is the same that I used for my Patriotic Wreath but with circles instead of squares, and only one color. 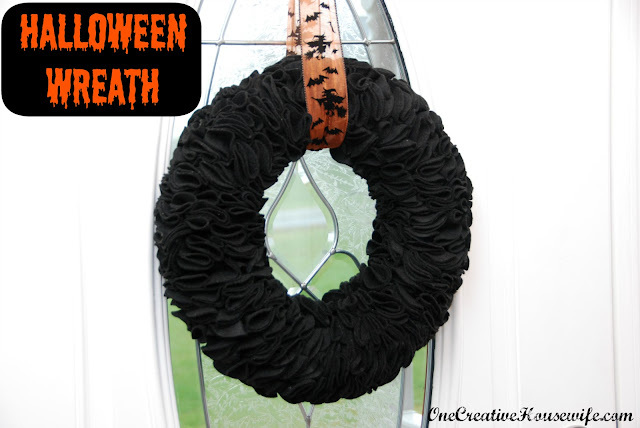 I used Method 1 while making the Patriotic Wreath and Method 2 for the Halloween Wreath. 1. 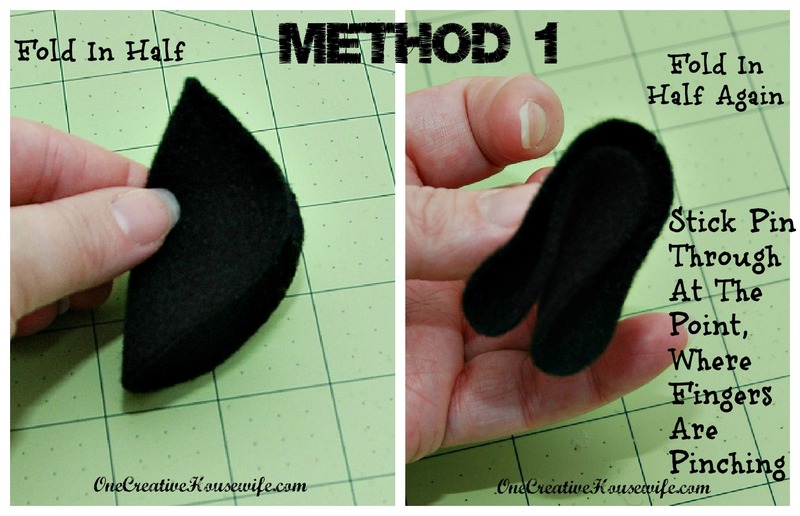 Cover your wreath with black felt. This will give the hot glue something substantial to attach to plus cover the back of your wreath, all in one step. To do this, cut strips of felt that are wider in the middle than the ends, wrap them around the wreath, and glue them. Make sure you put the wider part towards the outside of the wreath and the thinner part towards the inside of the wreath. Don't you just love my diagram? 2. 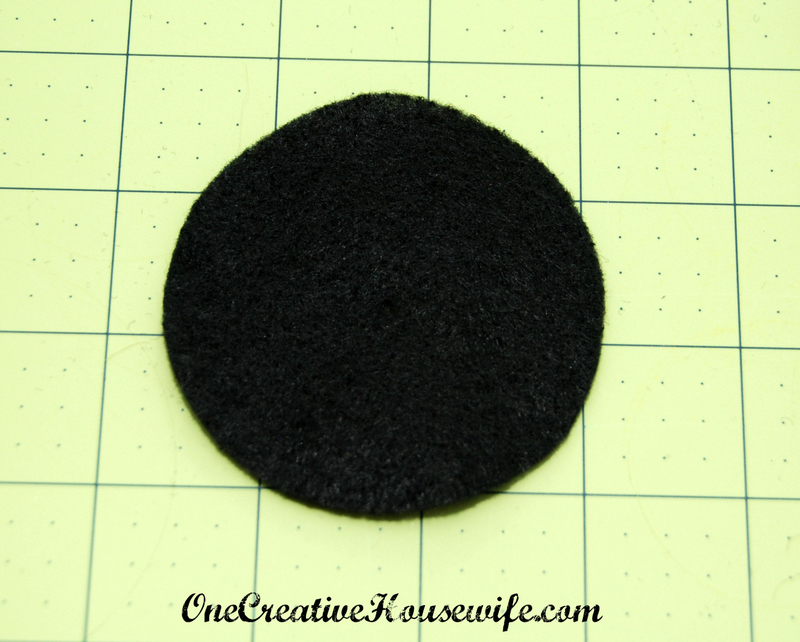 Cut the felt into circles with a 3" diameter. 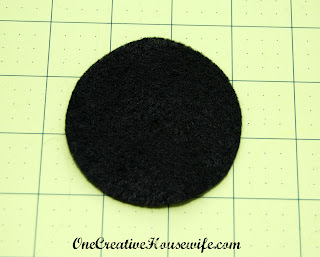 To do this you can either make a 3" circle template, trace the circles on to the felt, and cut them out. 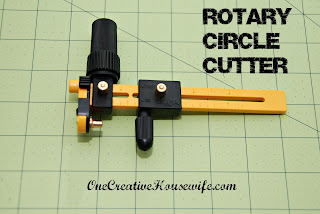 OR You can use a Cutting Mat* and Rotary Circle Cutter*. 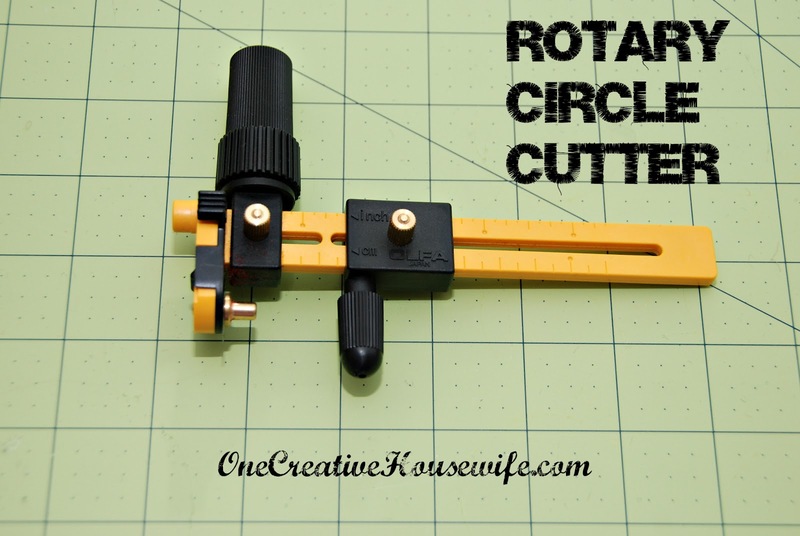 Set the Rotary Circle Cutter* to 1.5" and follow manufactures' instructions on use. Whatever measurement you set it to will be the radius of your circle. (Radius = 1/2 Diameter) In our case the diameter is 3" so half is 1.5". 3. Fold each circle in half, and then in half again; applying hot glue or straight pins as in the diagrams below. 5. Fill in with more folded circles where ever you see gaps. 6. 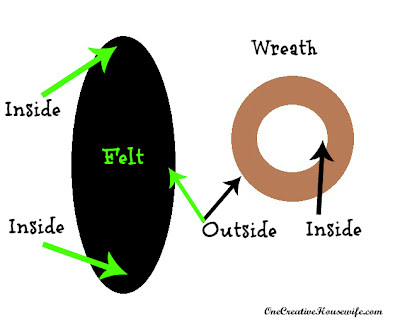 If you know where you are hanging the wreath you can measure, cut, and attach your ribbon now. I used a heat sealer* to cut the ribbon so it wouldn't fray. The ribbon it not actually attached to the wreath just looped through it with a bow at the end.